Historic shark ray pregnancies are progressing as expected. NEWPORT, Ky. — Newport Aquarium confirmed Tuesday, that its pregnant shark ray, Sweet Pea, has been moved to the aquarium’s offsite animal health facility for further monitoring as her due date approaches. On Oct. 14, Newport Aquarium announced both its female shark rays, Sweet Pea and Sunshine were pregnant– the second and third documented cases of shark ray breeding under professional animal care in the world. Here’s a short video of Sweet Pea swimming in Newport Aquarium’s Surrounded by Sharks exhibit from 2007 when the Shark Ray Breeding Program began. Sunshine, the aquarium’s second pregnant shark ray, can still be found in the Surrounded By Sharks exhibit, where she is expected to remain until closer to giving birth. Newport Aquarium veterinarian Dr. Peter Hill, who first confirmed Sweet Pea and Sunshine’s were pregnant estimates their due dates are within two to three months, with Sweet Pea expected to deliver first. Watch Sunshine’s ultrasound here. Nearly seven years after Newport Aquarium established the Shark Ray Breeding Program, Sweet Pea became the first shark ray to give birth while under professional animal care on Jan. 24, 2014. For more information on Newport Aquarium, visit NewportAquarium.com or call toll free 800-406-FISH (3474). Connect with Newport Aquarium on Facebook and Twitter, or subscribe to its blog, for the most up-to-date news regarding the shark ray pregnancies. NEWPORT, Ky. — Newport Aquarium announced Wednesday its two female shark rays, Sweet Pea and Sunshine, are both pregnant – the second and third documented cases of shark ray breeding under professional animal care in the world. Newport Aquarium animal husbandry staff confirmed the pregnancies after performing ultrasounds for Sweet Pea on Oct. 1 and Sunshine on Oct. 8. Newport Aquarium veterinarian Dr. Peter Hill, who conducted the ultrasounds, estimates Sweet Pea and Sunshine’s due dates are within two to three months, with Sweet Pea expected to deliver first. The equipment used to conduct the ultrasounds was on loan from the FETCH-LAB at the University of Cincinnati’s College of Allied Health Sciences. 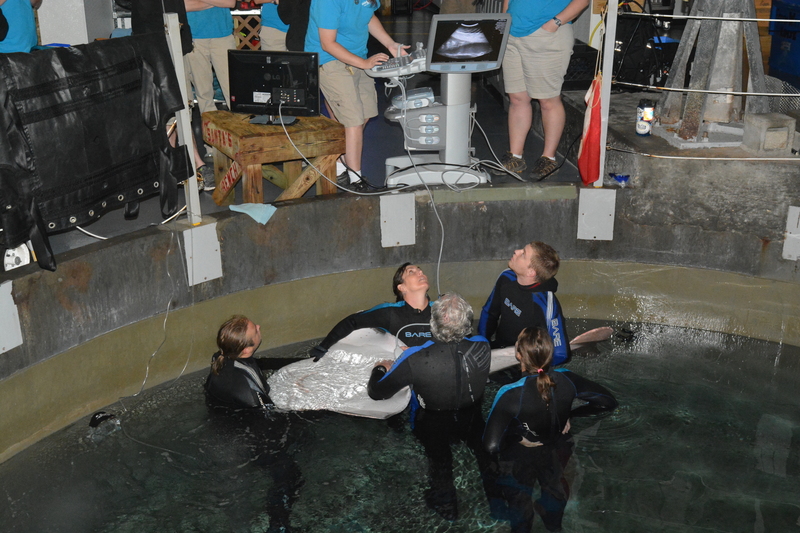 Newport Aquarium staff perform an ultrasound on Sunshine the shark ray on Oct. 8, 2015. Shark rays are a vulnerable species on the IUCN Red List of Threatened Species, one level from endangered. Threats to shark rays include habitat destruction, pollution, overfishing and the use of their fins for products, including shark fin soup. The public can still see Sweet Pea and Sunshine in the Surrounded by Sharks exhibit now through a to-be-determined time closer to their due dates, at which point they will be moved to Newport Aquarium’s offsite animal health facility in Northern Kentucky. 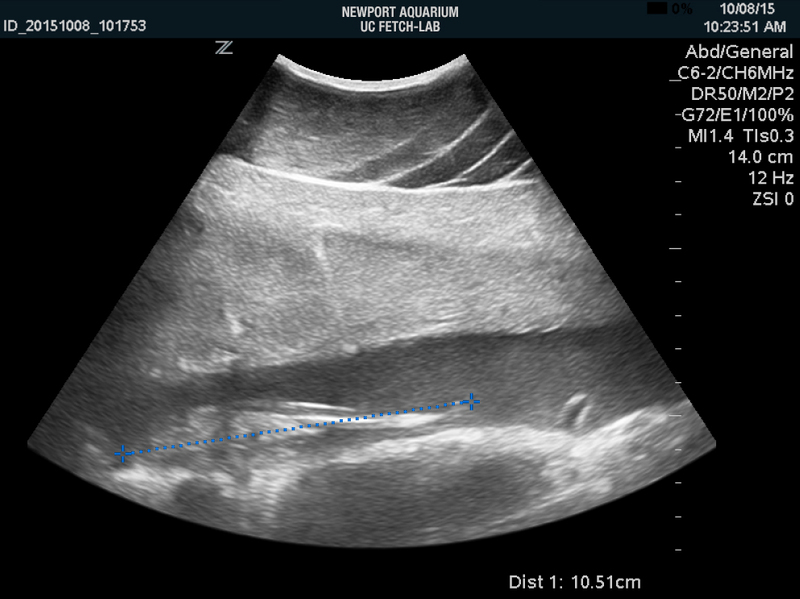 A screenshot from Sunshine’s ultrasound performed on Oct. 8, 2015, reveals a developing shark ray pup, measuring 10.51 centimeters (4.14 inches). Newport Aquarium established the world’s first Shark Ray Breeding Program on Feb. 14, 2007, when a male shark ray named Scooter was introduced to the 385,000-gallon Surrounded by Sharks exhibit. The breeding program expanded in winter 2013 when Sunshine moved from the Coral Reef tunnel to Surrounded by Sharks and a second male shark ray named Spike also was introduced to the Aquarium’s signature exhibit.